It never feels great to start your day by clearing up an icy windshield. It feels even annoying when you're running late for work. Of course, you don't have to face this issue if you have a garage or another covered area to park your car in winter, but not everyone will have this luxury. 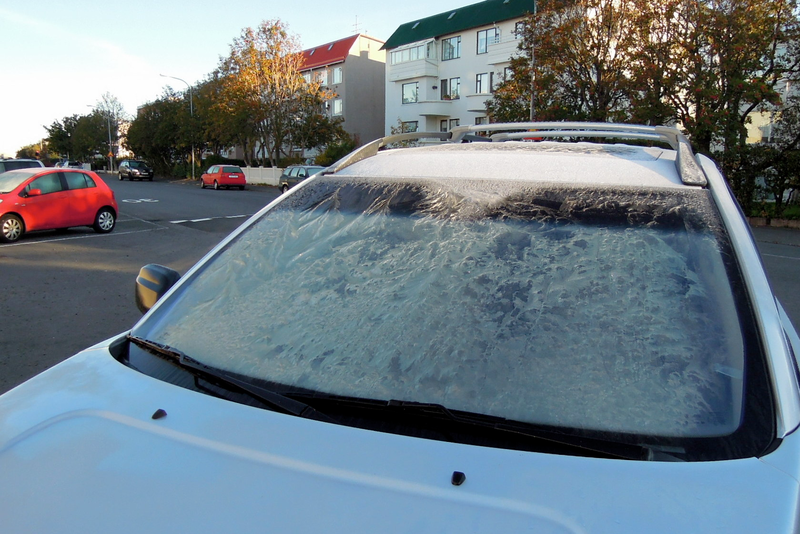 Luckily, you can try a few simple ways and learn how to prevent frost on windshield. Keep reading and you will know how to resolve this issue and start your day with no cussing and fussing involved. It's simple and effective. Keeping your windows covered will keep you from dealing with icy windows in the morning. A folded sheet, a towel, or even a piece of cardboard will do the trick. Make sure you have placed covers tightly over the windshield to prevent dew from forming in loose spots. You can even use the vipers on your windshield to keep the cover in place. You have to remove them carefully in the morning because they may be wet and throwing them immediately in your trunk will cause damage. You may consider using a watertight barrier – something like a tarp will work just fine. There won't be much ice to get rid of, but you may still find some icy spots here and there. Make use of a plastic scraper and use it gently to remove small patches of ice. Sometimes, using your car's vipers will be enough to fix the issue – be sure to use some wiper fluid to clear anything that's obscuring your vision. If simple precautions don't work, you can still try other ways. Here's more about how to prevent frost on windshield with homemade spray. You will need 3 parts white vinegar and 1 part water as well as a spray bottle, funnel, liquid measuring cup, and marker. It is also a good idea to use food coloring and mix it while preparing the solution to distinguish it from other products in your home. Simply mix all the ingredients and pour it all in a bottle. You have your homemade solution ready for frost prevention. You need to spray it on your car's windshield at night to ensure the ice won't stick to the screen. Using your car's vipers will be enough to clear the ice. When you don't know how to prevent frost on windshield, you should at least know what you can do to get rid of ice that has already accumulated on your windshield. Go buy a commercial deicer or antifreeze for car windows. Almost all auto shops will provide you with a specially prepared fluid used specifically for deicing. Simply spray it directly on the icy spots on your windshield and leave it for a while. Let it soak in for a minute or two and use a plastic scraper to remove it. You may consider using more deicer to ensue you get rid of ice quickly and effectively. It is worth mentioning that you should not keep your deicer in your car if you're expecting temperatures of -29 °C or lower. Simply make a mixture of one part water and three parts white distilled vinegar. Now spray the windshield and other windows. Leave it there for a few minutes before you start wiping off snow. You don't have to add detergent to this solution because vinegar itself is a good cleaning agent. Using vinegar will definitely help, but it may not be as effective as alcohol. You need to prepare a solution by mixing two parts rubbing alcohol and one part water. For three cups of mixture, you should add at least one teaspoon of dishwashing liquid. To make things work even better, you may also consider adding a couple of cups of rubbing alcohol into your wiper washer fluid. This will make it easy to clean your windshield even if you're driving. Server responsed at: 04/18/2019 12:51 p.m.